The present study made an attempt to assess the quality of life (QOL) and the sociodemographic factors associated with poor QOL of elderly women residing in the geographic area under the jurisdiction of Medical College Health Unit, Pangappara, Thiruvananthapuram in South Kerala in India using the World Health Organization QOL (WHOQOL-BREF) scale. A community-based, cross-sectional study was carried out by the house-to-house visit to assess the QOL of elderly women using the WHOQOL-BREF scale. The WHO deﬁnes QOL as "an individual's perception of their position in life in the context of the culture and value systems in which they live, and in relation to their goals, expectations, standards, and concerns." In measuring QOL therefore, the WHOQOL Group takes the view that it is important to know how satisﬁed or bothered people are by important aspects of their life, and this interpretation will be a highly individual matter. The study was conducted in the Medical College Health Unit, Pangappara, Thiruvananthapuram, which included both urban and rural wards and had a population of 110,286 and 26,410 households as on July 2009. Elderly women aged 60 years and above residing in Pangappara Medical College Health Unit were eligible for the study. The total population of elderly women in Pangappara was estimated to be 7180. Written informed consent was obtained from each of the study participants before collecting data. Those who were unable to talk or respond to the questionnaire, those who had preexisting mental illnesses, and those who were not willing to take part in the study were excluded. QOL was assessed using WHOQOL-BREF questionnaire. This was translated in local language Malayalam and was pretested in the field before the survey. Moreover, this tool was already validated and pilot tested in South India. The total score of WHOQOL-BREF questionnaire was 400 which included items from four domains, namely physical health, psychological, social relationships, and environment. Data regarding sociodemographic variables were collected using a structured questionnaire which was finalized based on a pilot study done in a small sample of elderly women. The study period extended from July 15, 2009, to January 15, 2010. The sample size was estimated using the formula 4pq/l . Those scored less than the median were considered as having a poor quality of life. As per the pilot study conducted in a random sample of forty elderly women residing in Pangappara including twenty each from rural and urban areas, 27% had very poor QOL, 57.2% had moderately poor, 13.5% had moderately good, and only 2.3% had very good QOL. The prevalence of poor quality of life was expected to be around 84% accordingly. This information was used for the current study and effective sample size was estimated to be 76 with a precision of 90%. To account for the design effect of cluster sampling, twice the calculated sample was taken which came out to be 150. For the present study, data from 160 elderly women were collected. Sampling done was two-stage cluster sampling. Of the 29 wards in Pangappara area, 16 wards were identified using probability proportionate to size (PPS) sampling out of which 9 were from rural wards and 7 were from urban. Ten elderly women residing in each of these wards were selected as clusters for the study. The first house of every cluster was selected from respective wards as per convenience PPS done as follows. The total cumulative population which formed the sampling frame was calculated by taking the sum of the population residing in each of the 29 wards. As the sample size was estimated to be 160, cluster number was arbitrarily fixed as 16 for selecting ten subjects from each cluster. Sampling interval was found by dividing the total cumulative population by 16 clusters. A random number which was less than or equal to the sampling interval was selected with the help of a random number table. The first cluster was then located as the ward which contained the cumulative population same as the random number. The rest 15 clusters were identified similarly by using the formula "random number + sampling interval" for each cluster. The study protocol was submitted to the Human Ethical Committee after attaining clearance from research committee. The study was commenced only after getting consent from the Human Ethical Committee. Informed consent was also obtained from each of the study participants and/or the head of the family by using a consent form. WHOQOL-BREF questionnaire was administered to get data regarding QOL and a structured questionnaire for sociodemographic variables from 160 elderly women who were residing in 16 wards. Sufficient privacy was ensured while interviewing all the elderly women to avoid respondent bias which might happen if they were interviewed in the presence of other family members. Data obtained from WHOQOL-BREF were later categorized into "very good" (scoring above 75 th percentile), "moderately good" (scoring between 75 th and 50 th percentile), "moderately poor" (scoring between 50 th and 25 th percentile), and "very poor" (scoring <25 th percentile) QOL. No missing data have been found. Univariate analysis was done using proportions for qualitative variables and using means in case of quantitative variables. Odds ratios (ORs) were calculated after classifying the participants as cases and controls based on the median. Cases included those with very poor and moderately poor QOL who scored below 50 th percentile and controls included those with very good and moderately good QOL who scored above 50 th percentile. Multivariate analysis was done using logistic regression and adjusted OR was calculated. The problem of multicollinearity was assessed using a correlation matrix analysis built using variables significantly associated with the outcome prior to the multivariate analysis. Independent variables to create the binary logistic regression model were selected accordingly. The problems with outliers were also taken care of using outlier labeling rule and Dixon's Q test. The overall reliability of WHOQOL-BREF scale for assessing QOL was good with a Cronbach's Alpha of 0.952. Alpha value of various subscale ranged from 0.91 to 0.98. This ensures the reliability of the study tool under the current setting. The statistical analysis was conducted using the statistical package SPSS for Windows version 16 ( SPSS Inc, Chicago, IL). The baseline characteristics of all the 160 participants are given in [Table 1]. The mean score for QOL was found to be 177.42 (standard deviation [SD] =69.7) [Table 2]. While grading the QOL, only 2.5% (95% confidence interval [CI]: 0.07-4.84) of the study participants were found to have "very good" QOL, 38.8% (95% CI: 31.2-46.4) had "moderately good" QOL, another 43.1% (95% CI: 35.4-50.8) had "moderately poor" QOL whereas 15.6% (95% CI: 9.98-21.22) of study participants were suffering with "very poor" QOL. 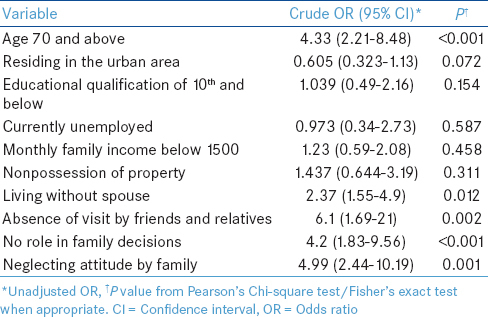 While doing domain-wise analysis, QOL [Table 2] score was least in the psychological domain (mean was 36.7, SD = 20) where more than one-fourth of the elderly women (28%) had "very poor" QOL and more than half (50.6%) had moderately poor QOL. Highest mean score was for physical- and health-related QOL (mean = 49.5, SD = 22) followed by environmental domain (mean = 47.38, SD = 17) and then social domain (mean = 43.7, SD = 18) where the proportion of elderly women falling under "very poor" QOL were 16.2%, 16.2%, and 14.4%, respectively. Case-control comparison revealed that the significant risk factors were age above 70 years with crude OR of 4.33 (95% CI: 2.21-8.48), absence of visit by friends and relatives with crude OR 6.1 (95% CI: 1.69-21), neglecting attitude by family members with crude OR of 4.99 (2.44-10.19), and not having any role in family decisions with crude OR of 4.2 (95% CI: 1.83-9.56). 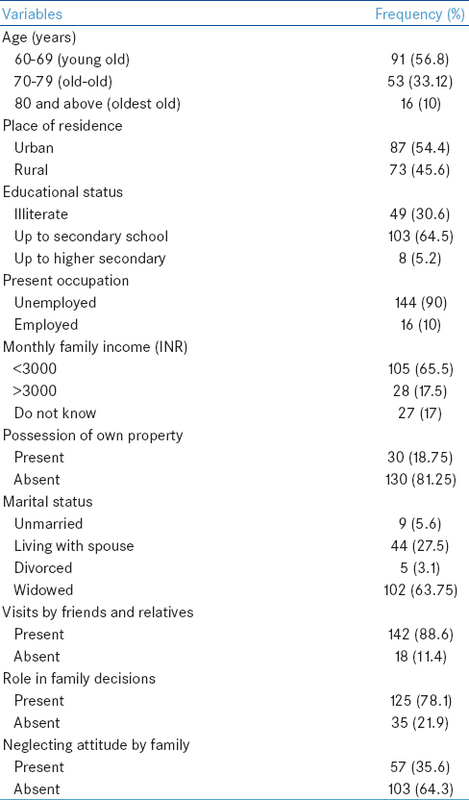 Educational qualification of 10 th and below, current unemployment, previous unemployment, monthly income below 500 rupees, monthly family income below 1500 rupees were also found as risk factors whereas living in an urban area was a protective factor [Table 3]. However, after doing logistic regression adjusted odds for age above 70 years increased to 11.30 (P < 0.001), nonpossession of property to 8.99 (P < 0.001), neglecting attitude by family members to 6.9 (P < 0.001), and absence of visit by friends and relatives to 9.9 (P < 0.001) whereas residing in the urban area became a significant protective factor (adjusted OR - 0.10, P < 0.001) [Table 4]. The classification table showed that the model could identify 96.9% of individuals with poor QOL correctly and could rule out 72.7%. The overall percentage is 90.7%. The model has got a Cox and Snell and Nagelkerke R2 = 0.478 and 0.613, respectively. The Omnibus tests of Model coefficients gave a χ2 = 20.70 (df = 4, P < 0.001). Hosmer and Lemeshow test for goodness of fit showed a χ2 = 13.18 (P = 0.106) suggesting a good model fit. As per 2001 census, 20% of elderly Indian women were literate whereas in Kerala, the figure was 58%. Even in 2007-2008, only 50% men and 20% of women aged 60 years or more were literate through formal schooling. Large numbers of the elderly females were found to be illiterate, and the reason might be that 60 years back, the female education was rare in our country including Kerala. 63.75% of elderly women were found to be widows in the present study. The marital status of the older women is an aspect of family structure that deeply affects their living arrangements, support systems, and QOL. It constitutes a multiple support system for them in terms of emotional, financial, and social exchanges. A study done by Agewell Foundation in 2011 revealed that older women who are living with their sons/daughters and grandchildren are suffering from emotional alienation. Due to the fast changing socioeconomic scenario of the country, younger generations hardly get time to interact with their elderly family members. The nuclear family system has also crushed strong traditional bond between grandchildren and grandmothers. Results brought out by Gulati on population aging and elderly women in Kerala states that 7% of the women above the age of 60 were employed. Only 14.5% of elderly women were found to be economically independent whereas the figure was comparatively more for elderly male coming to be around 41.7%. According to Prof. Irudayarajan, the old-age dependency ratio climbed from 10.9% in 1961 to 13.1% in 2001 for India as a whole and is projected to be 25% by 2021  For females and males, the values were 13.8% and 12.5%, respectively, in 2001. A study published by Central Statistics Office Ministry of Statistics and Programme Implementation in 2011 showed that among economically dependent elderly men in India, around 7% were financially supported by their spouses, around 85% by their own children, 2% by grandchildren, and 6% by others. Among elderly women, 20% and less depended on their spouses whereas more than 70% on their children, 3% on grandchildren, and 6% or more on others. Population aging is a reflection of social development and public health. However, "if aging is to be a positive experience, it must be accompanied by improvements in the QOL of those who have reached or are reaching old age." Elderly women in India are vulnerable to various hazards even from their infancy. Old age is an accumulation of all these hazards and disadvantages that reduces the QOL. In the Bureau of Women's Welfare and Development's Women in India-a statistical profile, it is clearly mentioned that psychological disorders are the major clinical symptoms of elderly widows. Anupriyo's study on "elder abuse and neglect" has found that the aged mostly are worried over finance and suffer from anxiety, feelings of being unwanted, isolation, and loneliness. A similar study conducted by Joshi et al. among the elderly population in Northern India showed that psychological wellbeing, physical and social support almost had identical influences on QOL. Few decades back, the condition of elderly women in India was not even mentioned as the average life expectancy of females was <60 years. However, now with fast-growing elderly population, increased life expectancy and higher percentage of elderly women among the elderly population, issues of elderly women is a matter of major concern. If we ignore this matter today, this may turn into a major social development challenge tomorrow. It is high time we shift our focus toward the issues of elderly women since they have specific needs which require special attention. This study suggests that majority of elderly women were having poor QOL, and it was most affected for those residing in the rural areas. There are multiple factors such as financial support, family support, and education which determine the good quality of life for elderly. It is possible to improve the QOL of elderly women by providing financial security, ensuring care, and by enhancing social relationships of elderly women. Barnabas AP. Participation of senior citizens in socio-economic development. Help Age India Res Dev J 2001;7:5-10. Chakraborti S, Sarkar A. Pattern and trend in population ageing in India. Indian J Spat Sci 2011;2:65-75. Archana S. Gender, ageing and health in India: Emerging problems. Help Age India Res Dev J 2005;10:11-22. Agewell Foundation. Older Women in India. The Economic and Social Council of the United Nations (ECOSOC). In Special Consultative Status at United Nations; 2011. Sikri DK. Population Projections for India and States 2001-2026. Report on the Technical Group on Population Projections Constituted by the National Commission on Population, Office of the Registrar General and Census Commissioner India; 2006. Census Data 2011. Census of India Website; 2011. Available from: http://www.censusindia.gov.in. [Last accessed on 2015 Jan 20]. Jeyalakshmi S, Chakrabarti S, Nivedita G. Situation Analysis of the Elderly in India Central Statistics Office. Ministry of Statistics & Programme Implementation Government of India; June, 2011. Agewell Foundation. Human rights & status of older women in India - A national study. NewDelhi: Agewell Research and Advocacy Center; 2011. Moli KG. Ageism in Kerala. Kerala Call 2004;24:10-1. Radhakrishnan MG. Old′s Own Country: Kerala′s Elderly Population Brings Forth a Crisis. India Today; 29 October, 2011. Shaju P. A Youthful, Migrant Workforce Takes Root in an Ageing Kerala. Indian Express. Sec: 11; 21 February, 2013. Available from http://archive.indianexpress.com/news/a-youthful-migrant-workforce-takes-root-in-an-ageing-kerala/1077170/. [Last accessed on 2015 Jan 26]. Zachariah KC, Irudayarajan S. Gulf Revisited: Economic Consequences of Emigration from Kerala Emigration and Unemployment. Centre for Development Studies Thiruvananthapuram. Working Paper. No. 363; 2004. Zachariah M. Ageing of Women in Kerala - An Analysis of their Consumption Pattern. Shodh Gangothri Indian Research in Progress. Synopsis of the Thesis; 2012. Available from: http://www.shodhgangotri.inflibnet.ac.in. [Last cited on 2012 Sep 17]. NSSO. Migration in India, 2007-08. NSS 64 th Round (July 2007-June 2008). National Sample Survey Office, Ministry of Statistics & Programme Implementation. Government of India New Delhi; 2010. Shaju P. Rapid Ageing Challenges in Kerala. Financial Express; 10 October, 2011. Available from: http://www.financialexpress.com/news/rapid-ageing-challenges-kerala/857772/2. [Last accessed on 2015 Jan 25]. State Planning Board. Government of Kerala. Economic Review-2005. Planning Board Thiruvananthapuram; 2005 Available from: http:// www.spb.kerala.gov.in/index.php. [Last accessed on 2015 Jan 27]. Ramamurti PV. The psycho-social scenario of the elderly - Problems, priorities and perspective. Help Age India Res Dev J 1996;3:3-9. Gulati L. Population ageing and women in Kerala state, India. Asia Pac Popul J 1993;8:53-63. National Sample Survey Organisation. Morbidity, Health Care and Conditions of the Aged. National Sample Survey 60 th Round (January-June 2004). Report No. 507. NSSO. Ministry of Statistics and Programme Implemention. Government of India; 2006. Suchitra ET. Assessment of Quality of Life among Elderly Population of Yeroorpanchayath in Kollam District. MD Thesis. Government Medical College, Thiruvananthapuram, India; 2008. Anupriyo M. Narratives of aged widows on abuse. Indian J Gerontol 2008;22:480-500. Joshi K, Avasthi A, Kumar R. Health related quality of life (hrqol) among the elderly in Northern India. Health Popul Perspect 2003;26:141-53.